Are you longing for a fresh, nutritious salad in the dead of winter? I love this Fennel, Beet, Blood Orange & Kalamata Olive Salad. It's flavorful and different; takes you out of the same old lettuce, tomato and carrot routine. This salad would go great with a hearty beef stew or roast chicken or pasta — just about anything, really. You can add lettuce to this salad, or serve it without. I like red onions but if you don't like them, you can omit them. 2. Cut off the beet greens, leaving at least 2 inches of the stems on, and leaving the root intact. (Stick the beet greens in the vegetable crisper for future use — they are delicious sauteed in bacon fat, lard, butter or duck fat). 3. Rinse the beets, scrubbing with a vegetable brush. Be sure to rinse between the stems. Pat dry or set aside to drip dry. 4. When the beets are dry, place them in a casserole dish or Dutch oven. Cover with foil and roast for one hour and 15 minutes, or until they are fork tender. 5. Remove beets from oven and let cool on a cutting board or plate. 6. Make the dressing: Juice 2 of the blood oranges and pour into a small mixing bowl. Mince the (optional) shallot and add to bowl, along with 2 tablespoons Champagne or sherry vinegar. Slowly whisk in 1/4 to 1/2 cup olive oil, pouring in a slow stream as you whisk. Taste as you go, using more or less olive oil depending on the size of your oranges (for small blood oranges, use 1/4 cup olive oil; for large navel oranges, use up to 1/2 cup). Add sea salt and freshly ground black pepper to taste. Set aside. 8. Quarter the peeled beets and set aside. 9. Drain the jar of olives and slice the olives in half. Set aside. 10. Cut the remaining 4 oranges into small bite-sized pieces, discarding the peels. Set aside. 11. Rinse and dry the fennel (or lettuce). If using fennel, cut off the stalks close to the bulb — discard stalks. 12. Slice the red onion thinly. 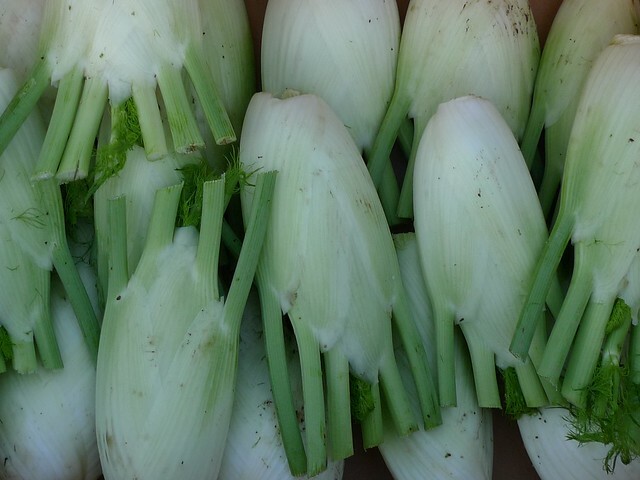 Slice the fennel bulb crosswise as thinly as possible (ideally use a mandoline) making “C” shapes. If using lettuce, tear it into large bite sized pieces. Set aside. 13. Make a bed of fennel (or lettuce). Layer orange and beet pieces, olive halves, and red onion (to taste) on top. 14. Whisk the dressing again, drizzle on top and serve. This salad looks so refreshing and delicious! I am co-hosting a citrus themed blog hop this month and, if you would like to share this recipe there, I think it would be a fantastic addition! I absolutely LOVE roasted beets:) The combinations of flavors sound yummy. Fennel is so good for you! I’ve tried fennel multiple times I just don’t dig the licorice flavor. This sounds really good I might have to give it another try!